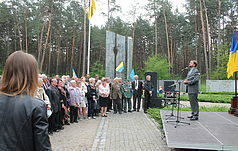 Opening of the exhibition "The Shot Elite: Bykivnian Discource"
On April 25, 2018, a photo-documentary exhibition prepared by the Reserve scientists "The Shot Elite: Bykivnian Discource" was opened on the territory of the National Historical and Memorial Reserve "Graves of Bykivnya". December 13, 2017 the presentation of the exhibition "Crossing the Kiev Styx" took place in Mariupol State University. This exhibition is a joint project of the National Historical and Memorial Reserve "Graves of Bykivnya" and "Kyiv Society of Greeks named after K. Ypsilanti. " 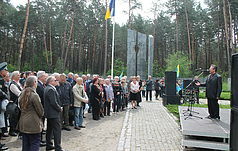 It is devoted to the fate of the Kiev Greeks, shot as a result of the so-called "Greek operation" - mass repression against representatives of the Greek community in all the republics of the USSR. 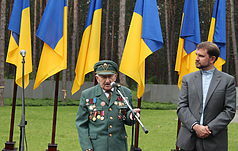 One of the NKVD "special operations" against representatives of national minorities was the so-called "Latvian". It began with the M. Yezhov ciphered tegram No. 49990 of November 30, 1937, which stated in order to liquidate the work of Latvian intelligence and to defeat the nationalist, anti-Soviet activities of Latvians in the USSR to "carry out arrests of the Latvians suspected of espionage, sabotage, anti-Soviet nationalist work " simultaneously in all republics, territories and regions since December 3, 1937. 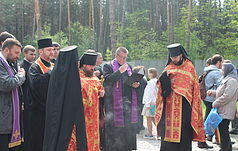 On November 27, 2017, representatives of the clergy employees of the National Historical and Memorial Reserve "Graves of Bykivnya", the head of All-Ukrainian Society named after Metropolitan Vasyl Lipkivsky's Arsen Zinchenko paid tribute to the memory of Metropolitan of the UAOC Vasyl Lipkivsky in the Reserve. International Conference " Coryphaeuses of Ukrainian Literature and Science"
November 10-11, 2017, the International Scientific and Practical Conference "Coryphaeuses of Ukrainian Literature and Science: Fundamental Contribution of the Neoclassics" was held. Its co-organizers were the National Pedagogical University named after M.P. 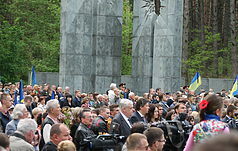 Dragomanov, the Literary-Memorial Museum of Maxim Rylsky and the National Historical and Memorial Reserve "Graves of Bykivnia". 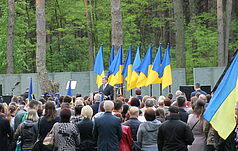 On November 1, 2017, the National Historical and Memorial Reserve "Graves of Bykovnia" was visited by an official delegation headed by the Chairman of the Supreme Chamber of Control of the Republic of Poland Krzysztof Kwiatkowski accompanied by the Extraordinary and Plenipotentiary Ambassador of the Republic of Poland in Ukraine Jan Peklo and representatives of the Embassy. 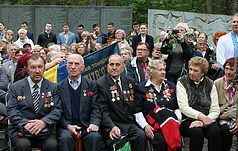 MP Anton Gerashchenko participated in the event from the Ukrainian part. 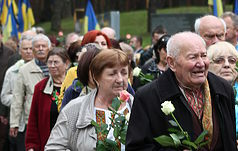 On October 28, 2017, the National Historical and Memorial Reserve Graves of Bykivnia together with the Public Organization "Ukrainian World" and "Free Ukrainian Language Courses" held a cultural and educational event for the 125th anniversary of the birth and the 80th anniversary of the shooting of Mykhail Semenko, the poet, the founder of Ukrainian futurism. 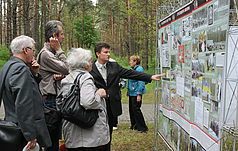 On October 22, 2017, the National Historical and Memorial Reserve "Graves of Bykivnia" was visited by an official delegation headed by Deputy Prime Minister and Minister of Culture and National Heritage of the Republic of Poland Petr Glinsky.